Rookie tight ends don’t generally offer a ton of production in their first year and the 2018 season wasn’t much different. While some of the best from the season’s class offered mild value as matchup based streaming options, no one really stood out as a generational talent. Here’s a quick look at some of the top options at the position from the 2018 draft class and what to expect going forward. 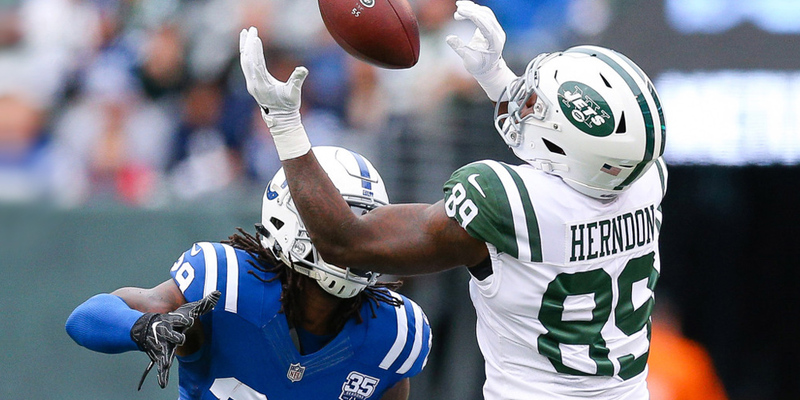 Herndon was the top performing rookie tight end in the 2018 season, though even he didn’t quite make the cut to be classified as a TE1 in fantasy football. He finished the season as the second-best receiver on the Jets with 39 receptions for 502 yards and four TDs. Herndon was able to sprinkle in five top-10 finishes over the course of the season with his best performance coming in Week 16 where he put up a 6/82/1 line against the Packers. 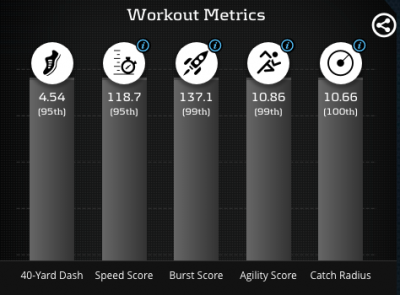 When looking at Herndon’s metrics on Player Profiler you’ll find his yards per target (9.0) and yards per reception (12.9) both ranked top-10 amongst all tight ends. The most impressive statistic would be his 92.9% true catch rate (which divides total receptions by total catchable targets) ranked first amongst tight ends. This was a solid start to what could be a promising career for Herndon as he showed capable of securing a role as a reliable receiving option for young Sam Darnold. Dark clouds are looming, however, as Herndon was busted for a DWI and will likely face a four-game suspension to start the 2019 season. There is also the coaching shift to Adam Gase and Dowell Loggains for the 2019 season. The new coaching duo ran one of the slowest and lowest scoring offenses in the league in 2018 that all but forgot the tight end could be utilized as a pass catcher despite having the extremely athletic Mike Gesicki (more on him below) at their disposal. Herndon offers more value than he’s worth in dynasty leagues at the moment. He will have to prove his worth to the new coaching staff to be able to regain consideration as a matchup-based streaming option in 2019 redraft leagues. The biggest rookie story for the Ravens in 2018 was obviously everything surrounding Lamar Jackson, but Mark Andrews vastly outplaying first round draft pick Hayden Hurst was an excellent sub-plot that didn’t garner enough attention. Andrews proved a solid weapon down the field as his 11.0 yards per target and 16.2 yards per reception both ranked second best amongst tight ends. His 2.1 fantasy points per target were fourth best for a TE and he also ranked top-10 with an average of 1.6 yards of separation per target. It will be interesting to see how the tight end position shakes out in Baltimore for the 2019 season. Hayden Hurst didn’t enter 2018 healthy and Lamar Jackson looked very uncomfortable in the pocket in his first year. Andrews gives you a lot to get excited about as an individual player but based on the way this team is built, his ceiling is severely capped by their low volume passing game. There will be some matchup based streaming upside still in the future but it’s tough to feel comfortable expecting a big boost in production from Andrews despite his capabilities. Dallas Goedert is another player whose impressive rookie year got masked by bigger storylines on his team. 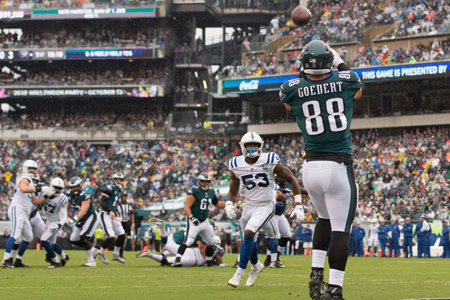 While Zach Ertz rightfully gained loads of attention for breaking Jason Witten’s single-season receptions record for a tight end, Goedert was busy chipping in on key plays. Goedert was efficient with the targets he did see, finishing out with a 78.6% catch rate and 4 TDs on the season. The Eagles weren’t afraid to utilize two tight end sets in 2018 either as Goedert saw the field on about 48% of the team’s snaps. While Ertz obviously isn’t going anywhere on this offense, Goedert offers some standalone value based on his role in the end zone. He could also be viewed as the highest upside handcuff at the tight end position should Ertz ever miss time with an injury. We could also potentially see Goedert go the way of Trey Burton and get traded to another team where he could serve as a starting tight end. Goedert is a solid hold at the moment in dynasty leagues. Ian Thomas was thrown into the fire in his first year with the Panthers as Greg Olsen missed significant playing time for the second straight season. Thomas technically got two cracks at the starting gig in 2018. The first go around he looked like a deer in headlights and was never utilized in a large enough role in the passing game. The second half of the season, Thomas looked much more comfortable and the team was also looking to see what they had in him as their season was swirling down the toilet. Thomas finished as a top-12 tight end in four of the last five weeks of play. We will have to wait and see what the future holds for Cam Newton in the 2019 season as it’s been speculated that he may sit out the year to get his shoulder right. Greg Olsen’s status will also be a deciding factor on just what kind of value Ian Thomas will have moving forward. Thomas offers raw talent with impressive workout metrics. He just needs a little fine tuning and obviously the starting role for good. Will Disslyhad a short-yet-sweet start to his career in the NFL. It seems like a lifetime ago when Dissly was the overall TE1 in the league for the first two games of the season. It didn’t really matter that Dissly was a virtually unknown, late-fourth round draft pick with wheels like a dump truck, the team had a plan for him and executed it. After Dissly went down, no other tight end ever really stood up and was able to make an impression on an offense that had just previously utilized Jimmy Graham relentlessly in the end zone the year before. Dissly will be a name to watch through training camp and preseason to see if he can regain a solid role on this run first offense. Hayden Hurst was a colossal bust as a first-round draft pick as he idly sat by and watched fourth rounder Mark Andrews outplay him at every turn. Hurst made some noise in the preseason before he got hurt, especially with Lamar Jackson under center, so it will be interesting to see how things will shake out in year two. As mentioned with Mark Andrews, this is such a low volume passing attack at the moment that it would take a significant improvement from Jackson for even one tight end to flourish on this offense let alone two. Hurst could be worthy of a pickup as a post-hype sleeper if you’re desperate at the position and can get him essentially free. Expectations should remain tempered going forward, however. A new coaching staff could do wonders with this offense. If they utilize Gesicki primarily as a pass-catching tight end, we could see some impressive numbers come his way. Based on raw talent and athletic ability alone, Gesicki is actually the tight end I am most excited about going forward who just didn’t get the opportunity to thrive in his first year. I would buy, buy, buy on him for pennies right now just in case he does get more run in his second year.